Case modding is almost an art, allowing people to express their artistic sides with their high-tech computers. Modding has exploded in the past few years and companies continue to release new and unique products to the market. Today's review considers a new line of products from Sunbeamtech with a twist: Silent Anodized Fans that glow with their embedded LEDs. "Sunbeam Company, a true art innovator in the field of PC modification and accessories at all aspect, targets on providing the top quality and state of art computer products to high tech PC users. We dedicate outstanding high quality control as our number one priority and deliver the products with the highest level of excellent Performance, as well as the coolest Innovation and an Appearance that draws your attention. Launched as a promising new company in the field of optoelectronics in 2000, Sunbeam Company specialized in developing cold cathode fluorescent lamps (CCFL), and furthermore extended to manufacture various modding equipments. Throughout the years, we now expand our product coverage to provide pioneering and fancy computer application at all aspects, while focusing on, but not limiting to, cooling systems and computer cases. Our mission is to satisfy PC players all over the world who are tired of boring traditional computer impressions and longing for experiencing the excitements of revolutionary hardware designs. Sunbeam Company is headquartered in Taipei County, with manufacturing factories located in Dongguan City, China. In order to provide exceptional product quality combined with superior customer support, we keep updating and advancing ourselves to meet the diverse changes and increasing market demands. We strive to continue designing and developing ground-breaking, exciting, and appealing products as well as being the one stop resource and solution for all computer enthusiasts seeking to turn their ingenious visions into the coolest and fanciest reality." 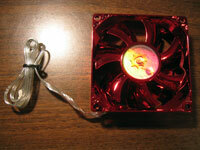 The fans are sold in packaging typical of any fan, but do provide a good look at the unique appearance of the fans. Hopefully, you can see how well Sunbeamtech did with the anodized coating on their Silent Fans. The pictures really do not do justice to the vibrant color you see when the fans are either "on" or "off" in-person. The glow you see is created by four embedded LEDs that reflect off the glossy anodized surface of the fans. 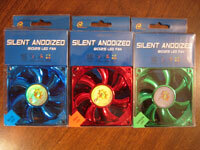 As the manufacturer states on the packaging, the "silent" fans are pretty quiet. Although not perfectly silent, at 20db you should not expect to hear these fans over other system noises. With the low noise, comes a relatively low air flow, but for most users a few fans rated at 23CFM such as these, will cycle plenty of air through the computer case. If you are interested, a short movie (@ 20sec./900KB) has been created of the running fans. Please view the movie here. Case modding is a special way to express an individual's tastes. When reviewing items such as these fans, there will undoubtedly be a difference in opinion from one person to the next. 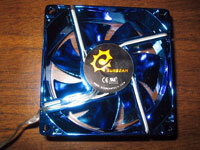 Personally, I love the look of the glowing anodized fans from Sunbeamtech. 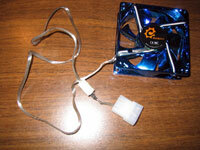 Plus, the fans provide what they promise; near-silent operation with decent airflow. However, at a price of $8 per fan (according to a few sites from the Sunbeamtech "Where to Buy" page) it is more than I would be willing to spend for my case to look "better". Others may not agree and that is the beauty of modding, everyone has their personal preferences. These fans are a new release from Sunbeamtech, and not all the merchants on their "Where to Buy" page carry them yet. Following their link to Xoxide will find them for you, and Frozen CPU and Performance PCs should have them very soon. 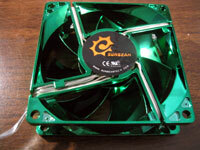 The Sunbeamtech Anodized Silent Fans reviewed today are without a doubt aimed at case modders. For the nice finish and cool glowing effect, they earn 4.5 out of 5 stars... "Readily Recommended". 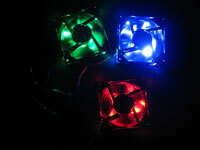 Special thanks to Sunbeamtech for providing the Silent Anodized LED Fans to Bigbruin.com for review!